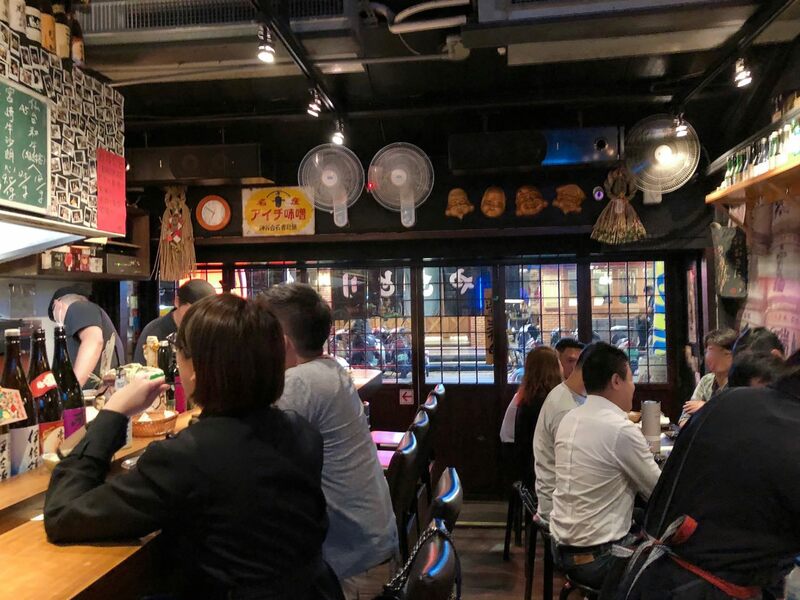 Kawaga Izakaya is located near Zhongshan Junior High School MRT station. 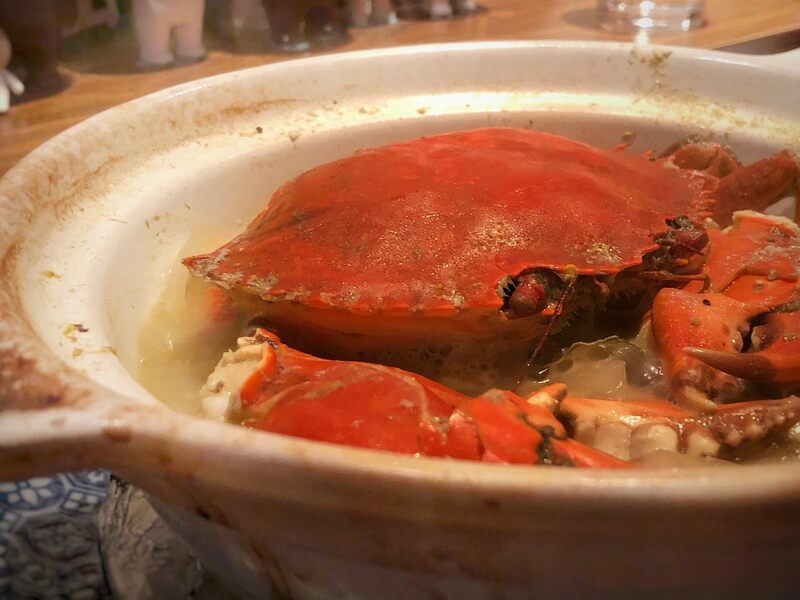 Their signature dish is Crab with Butter (2 cooking methods). I have the chance to try out their cuisines. 川賀居酒屋位於中山國中捷運站和行天宮捷運站中間, 離上次我去的 “WINE-derful 酒窖餐廳” 相當近, 雖然位於巷弄, 但人氣可說是強強滾. 從外觀看來極似像 “喀佈貍串燒居酒屋” 深夜食堂,詢問之下得知 11 pm 是最後出餐, 店面則是開到半夜 12:30, 此外, 請注意一人低消 NTD $800. 一走進室內就感受到日式居酒屋風格- 喧嘩, 緊迫和燒烤氣味. 被安排坐在板前檯座位, 等待朋友的同時觀察居酒屋裝潢, 牆上放滿顧客歡樂照片, 照片旁的小黑板寫了少許料理的“當日價格”, 板前除了清酒和酒標擺設外, 門口的展示冰櫃也有放置現流海鮮. 當天用餐, 每桌用餐皆會招待免費脆醃蘿蔔, 店家準備很多料理, 我直接從我喜歡的菜餚開始寫. 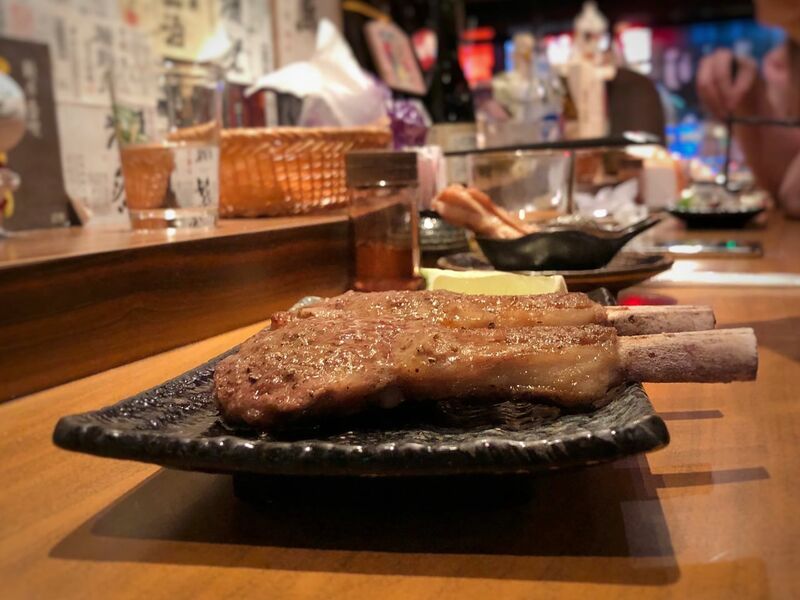 Kawaga Restaurant is located in between Zhongshan Junior High school and Xingtian Temple MRT station. It is quite near “WINE-derful restaurant”. Even though the restaurant is located at the alley, there are still many customers, mostly the office workers nearby. From the restaurant outdoor appearance, it is a bit like “Kabuli Restaurant” near Xinyi Anhe MRT station. This last serve is 11 pm and the restaurant is closed after midnight 12:30. Also, each person’s minimum charge is NTD$800. 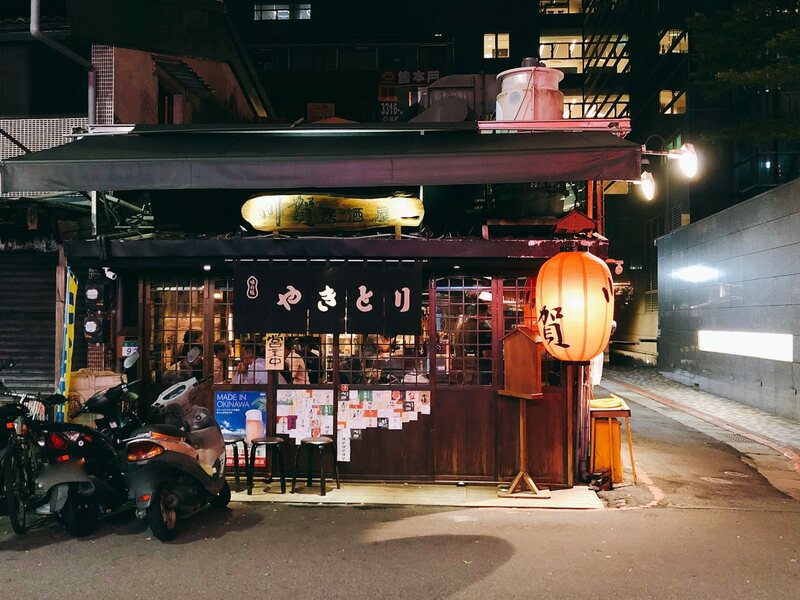 When walking in, the indoor is full of Japanese Izakaya Cultures – Crowed, Grilled Aroma , happy dining environment. My friend and I were seated at the counter. There are many customers pictures on the wall. 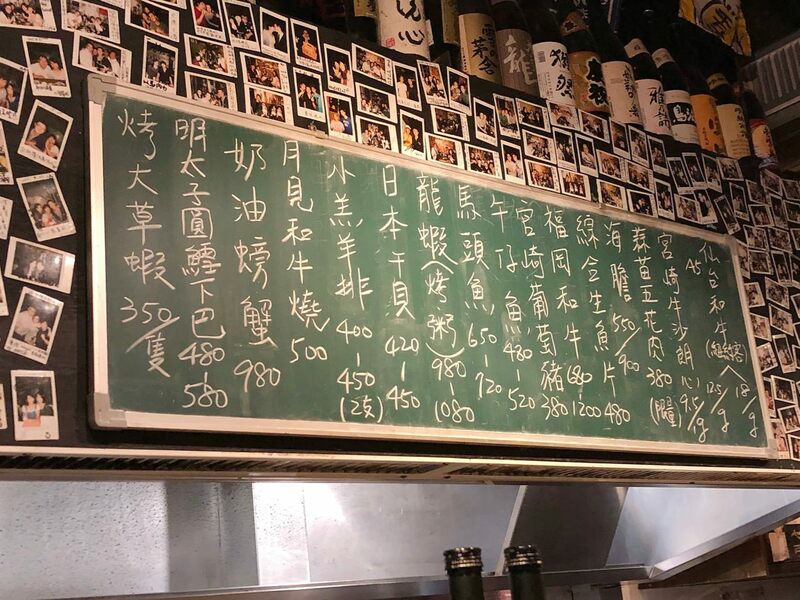 The little black board also stated the “daily seafood and meat price”. 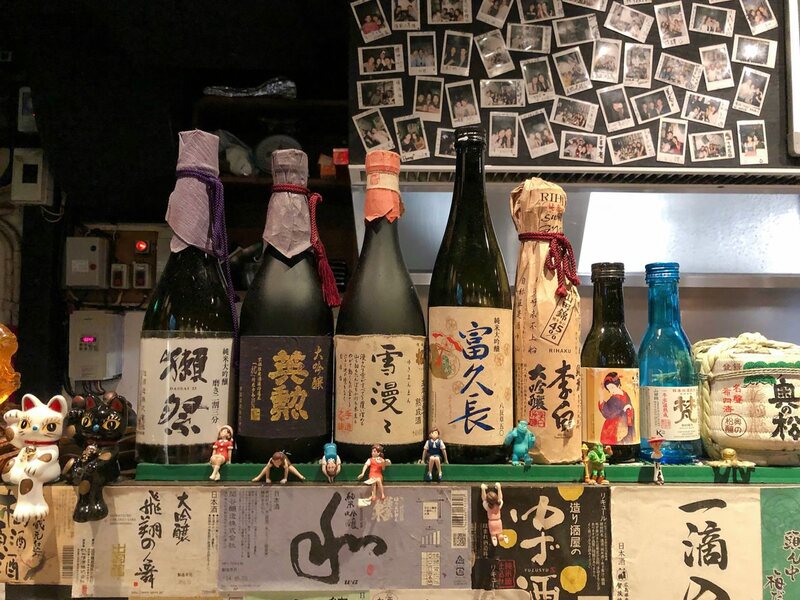 The counter also has many sake and its label decoration. 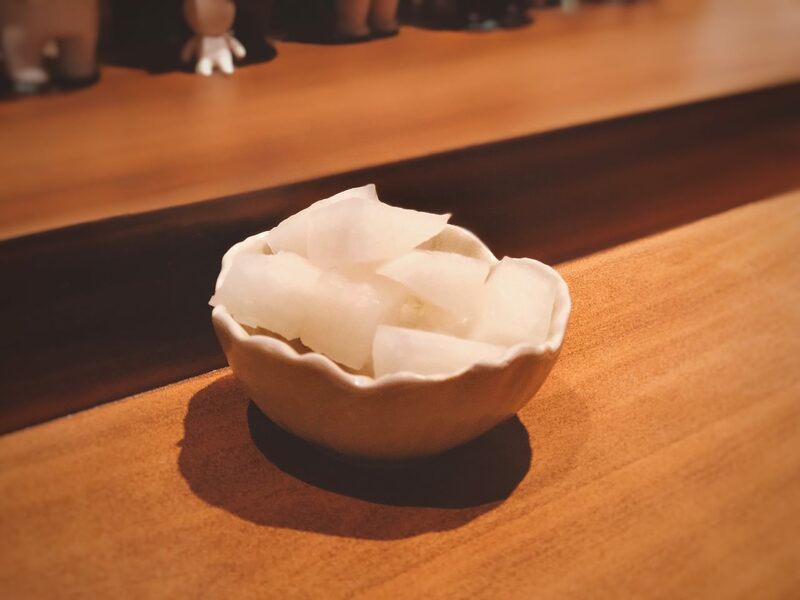 Every table is served with free pickled crispy radish. The restaurant prepared quite a lot dishes for us. I will start reviewing from the favorite dish. 海膽其實也有時價差異, 因為店家採用的海膽種類不同, 也有時候會採用非日本國家的海膽. 菜單上寫日本海膽有一份(小) 和一盒 (大) , 店家幫我們準備的是一份日本馬糞海膽, 這道日本馬糞海膽色澤呈現飽滿金黃色, 少許水滴停留在海膽表面, 我先單吃了一口海膽, 其顆粒並沒有很明顯, 整體吃起來並沒有大家所誤認的濃郁海味, 而是隱約微甜, 但吃起來卻相當細緻. 我會建議將適量海膽包進海苔, 再加少許蔥和哇沙米入口, 文末影片皆有介紹. 酥脆海苔搭配濕潤海膽賦予口感多層次, 辛辣刺激著味蕾, 吃出日本意境. 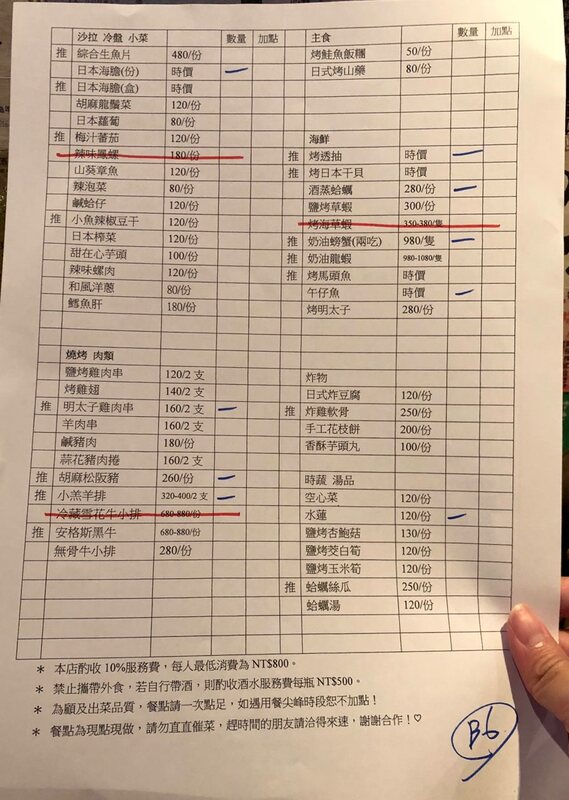 當日時價是 NTD $550, 老實說, 川賀居酒屋的份量比我想像中地多, 我習慣單吃一小口海膽或是一貫海膽壽司, 我朋友則是一次將一大匙海膽搭配海苔, 我會推薦 3 ~ 4 人享用一小份較適合, 畢竟市面上一個海膽壽司單價高, 搭配海苔過乾癮也可以. Of course Sea Urchin has different price, due to its origins and types. The menu mentioned that this dish has small and large size. Kawaga Restaurant prepares the small size of Japanese Sea Urchin for my friend and I. 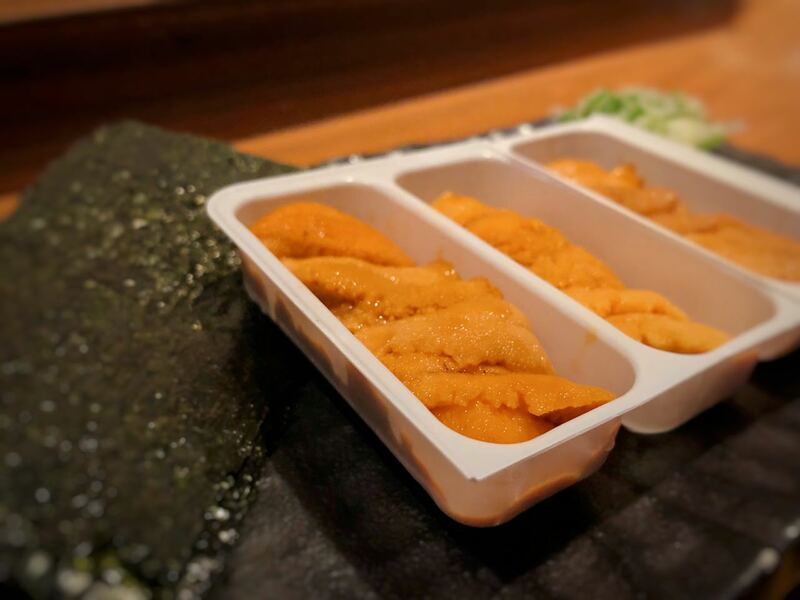 The golden color sea urchins are moist but with creamy but yet delicate texture. 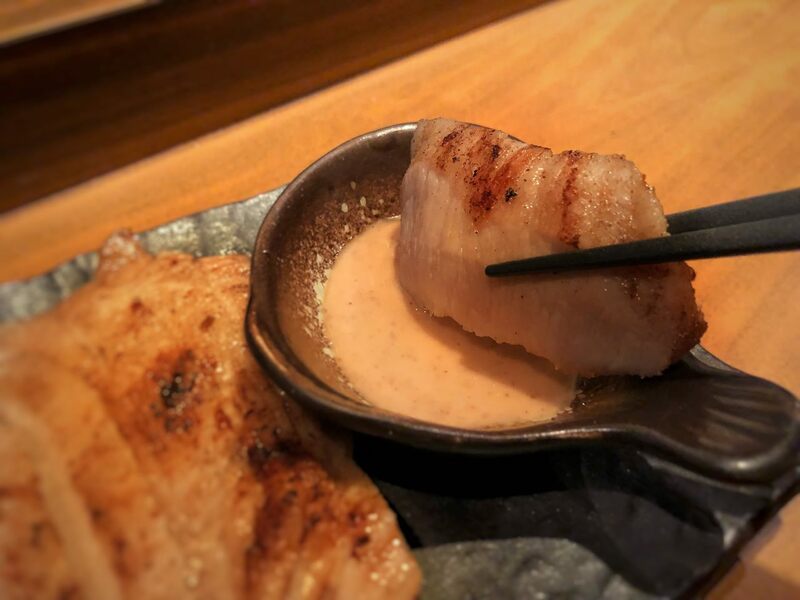 However, the sea urchin doesn’t have the thick sea flavor as people thought. Instead, it has hints of sweetness. 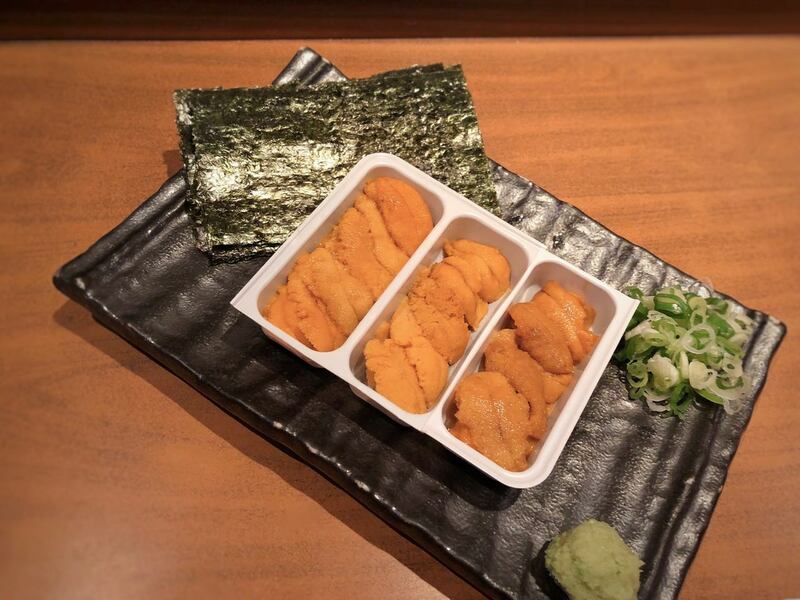 The correct SOP would be place the sea urchin on the seaweed, then put the green onion and wasabi in between. The video at the end of article has details. 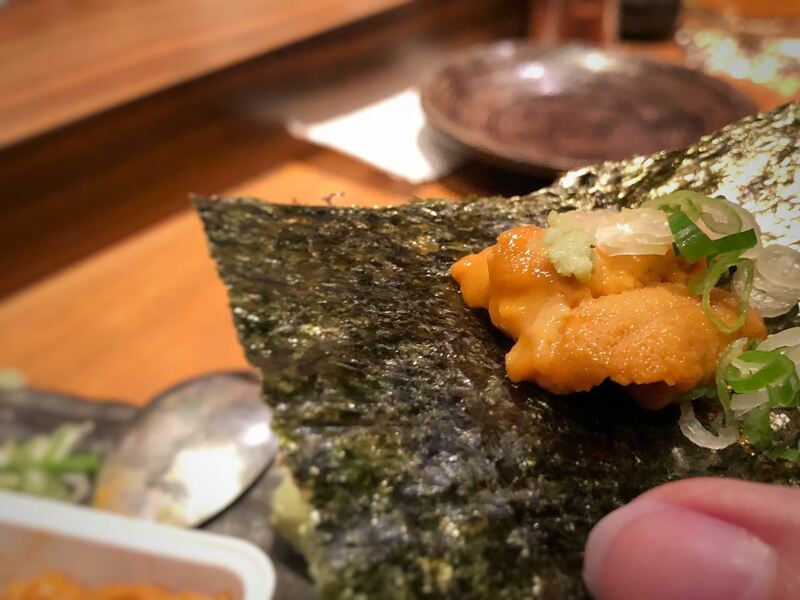 Crispy seaweed pairs with creamy sea urchins has layers of texture. The spicy flavor from the wasabi brings quite an impact on the tastebuds. The daily price of the small size is NTD $550. Honestly, it is cheaper than I expected. I would suggest 3 ~ 4 people to share this dish. In Taiwan, the sea urchin nigiri could be quite expensive. So, pairing with seaweed is not a bad idea. 很難想像我第二個喜歡的居然是小羔羊排. 雖然菜單上有寫小羔羊排價格, 但會以小黑板價格為主, 原因是因為每支小羔羊的重量不盡相同. 用餐當日, 主廚採用來自紐西蘭的羊排, 雖然都是小羔羊, 但 “花酒藏海鮮吧”的小羔羊 Size 較大但單價較高, 川賀居酒屋只是用簡單椒鹽調味, 而非像 “al sorriso 義式餐廳” 額外用醬來點綴. 油亮深褐色小羔羊排飽含油脂, 因此出乎意料地偏嫩, 單純的鹹肉香伴隨著椒鹽香入口, 何嚐不是一種享受! My second favorite dish is Grilled lamb rack. The price would be based on the blackboard instead of the menu due to its weight. The chef prepares the lamb rack from New Zealand. As for the size, “Aplus Grill & Seafood Bar”’s lamb rack is larger but much more pricy. Unlike “al sorriso Italian restaurant”, the chef only uses simply peppers and salts to grill with the meat. The dark brown color lamb rack is unexpectedly tender. The meaty flavor has the classic salt and pepper flavor. It is simply and yet delicious. 小黑板上也有寫奶油螃蟹兩吃的時價, 這次與菜單價格相同.川賀居酒屋的奶油螃蟹是一年四季皆有, 並不用等到秋天. 店員將一整個砂鍋置放在板前空間, 奶油螃蟹鍋粉墨登場! 鮮橘紅色螃蟹沙公與深黃色奶油高湯渲染出夕陽般色系.小心翼翼地將滾燙混濁高湯入口, 味蕾察覺到柴魚與奶油融合風味, 間接掩蓋住月桂葉的辛香. The blackboard also stated the daily price of this dish. The staff brings the pot at the counter. The boiling bonito broth indicates that the pot is quite hot. 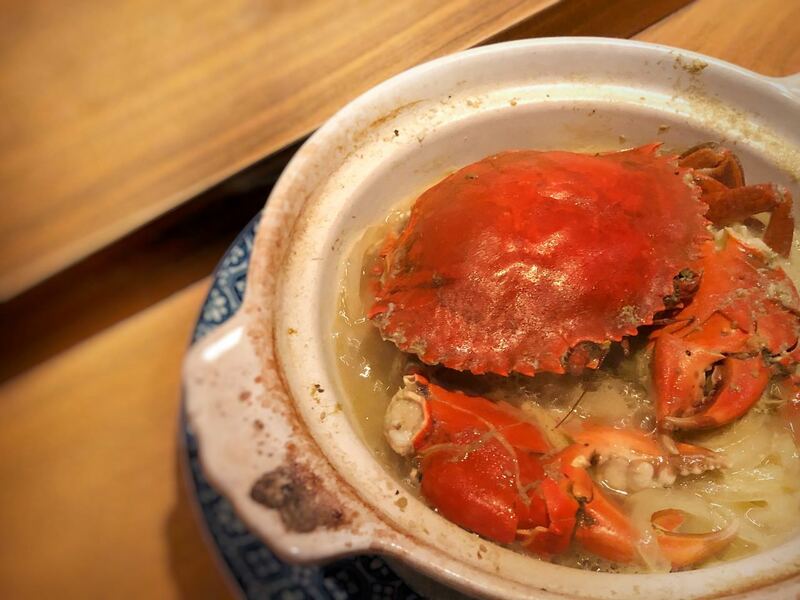 The bright orange-red color crab and dark yellow creamy broth color is a bit like sunset color. I tried one sip of he broth, there is a obvious bonito seafood flavor mixed with butter. But, I couldn’t sense the bay leaf that the staff mentioned. 值得一提的是為了客人著想, 主廚已經將蟹螯和蟹身都已先稍微敲開, 因此不需要器具用力地敲開, 只是要小心碎殼別入口, 螃蟹肉質緊實, 也許是因為飽含奶油風味, 螃蟹本身海鮮味需要細心察覺. 接著店員會告知要端砂鍋去煮粥, 跟“上引水產”和“橘色涮涮屋”桌邊服務煮粥不大一樣. 雖然煮粥需要一些時間, 我相當期待! 不僅湯變得更濃厚, 具有巧思地加入七味粉也成功升級此道螃蟹粥, 每一口粥有微辛香與奶油, 暖心又暖胃, 相當不錯, 我推薦這一道料理, 我會推薦3 ~ 4 人就可以點這一道. The most important part would be the customer doesn’t need tools to knock the crab open to enjoy the meat. However, the customer need to be careful about the small broken shell. 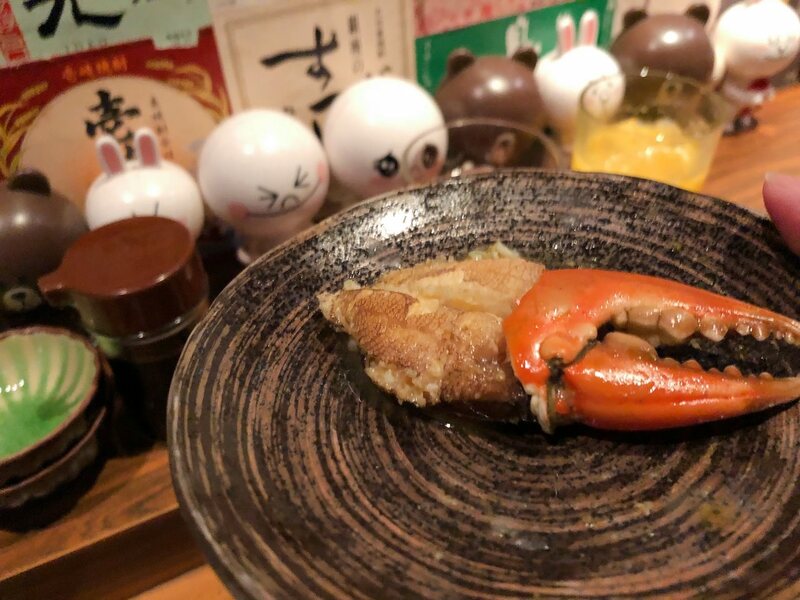 The crab meat is dense but with less seafood flavor. After 10 ~ 15 minutes, the staff would return to take the pot back to cook porridge with broth. The method is a bit similar with “Addiction Seafood Market” and “Orange Shabu Shabu”. After a while, the staff served a great amount of seafood porridge. 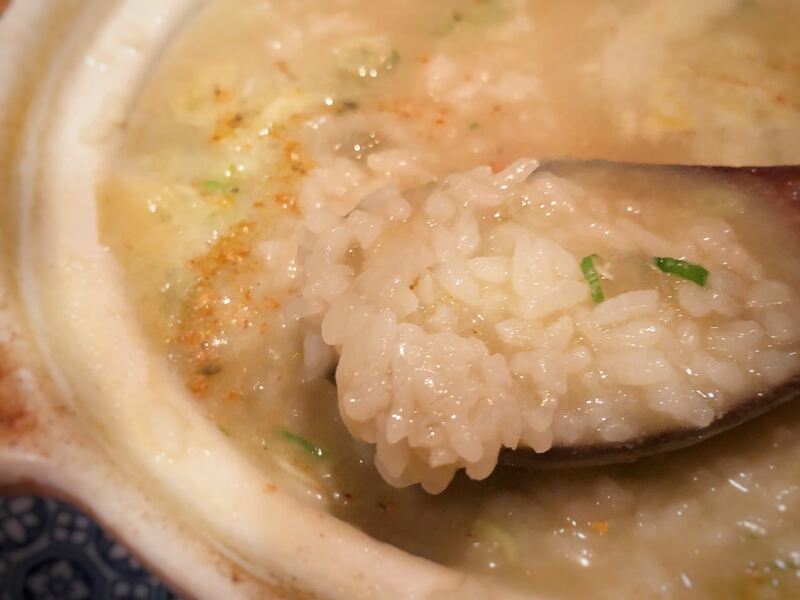 The broth becomes thicker with hints of spicy flavor from Shichimi and creamy butter. I recommend this dish! 明太子雞肉串平均一支 NTD $80. 享用這道串燒時, 要小心明太子醬將順勢滑下, 我會建議平行入口, 才能讓味蕾被滑潤醬汁包圍. 這道料理的顏色並不是經典深橘黃色, 而是淺橘黃. 此道明太子雞肉串是採用雞胸肉, 鹽烤雞肉串則是用雞腿肉, 肉雖然沒有像 “饞食坊” 串燒緊實, 但明太子醬汁代替油脂讓雞胸肉並不會過柴. 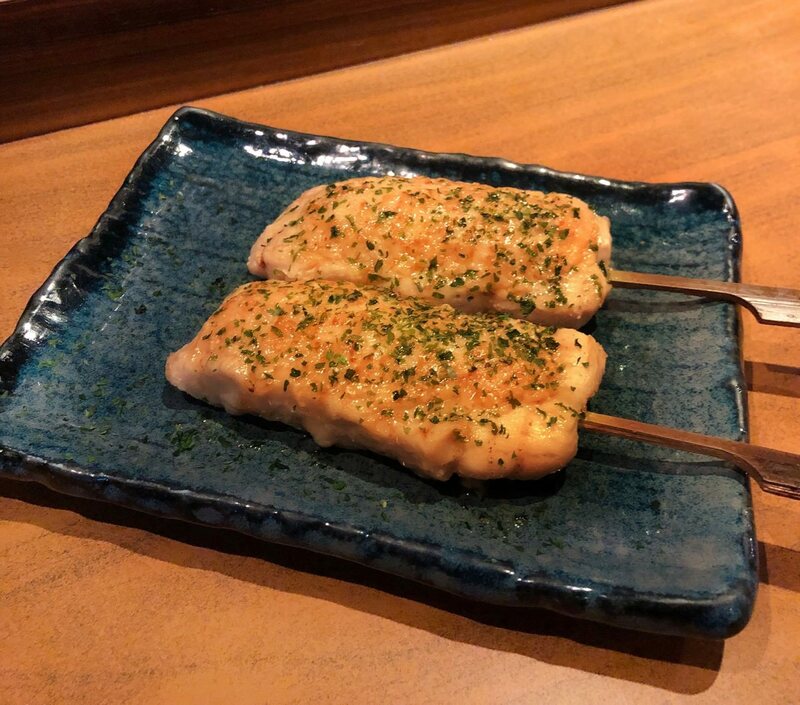 The average of one grilled chicken with roe is NTD $80. The customer would be need be careful regarding the roe sauce falling apart. This dish is not the classic dark orange-yellow color. Instead, the color is light orange-yellow. The chef uses chicken breast instead of chicken leg. 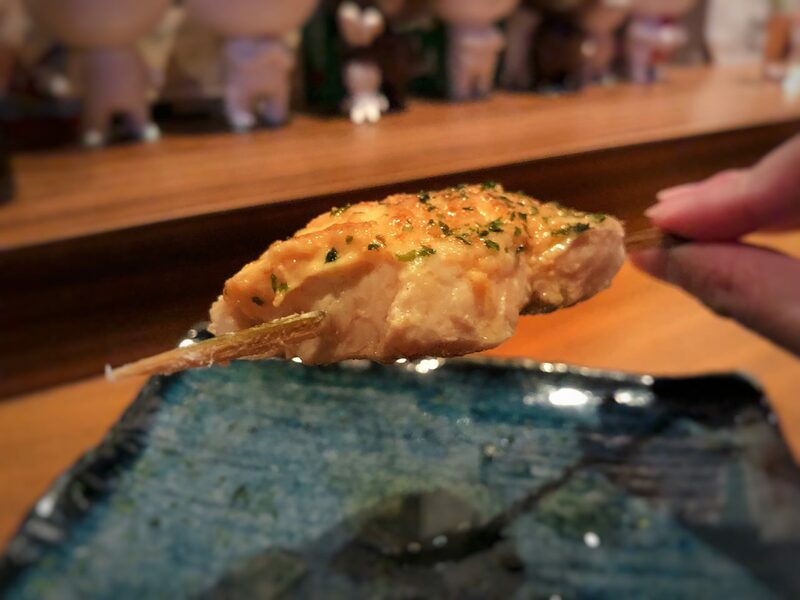 It is actually a smart decision since the roe sauce is moist enough to substitute the fats. 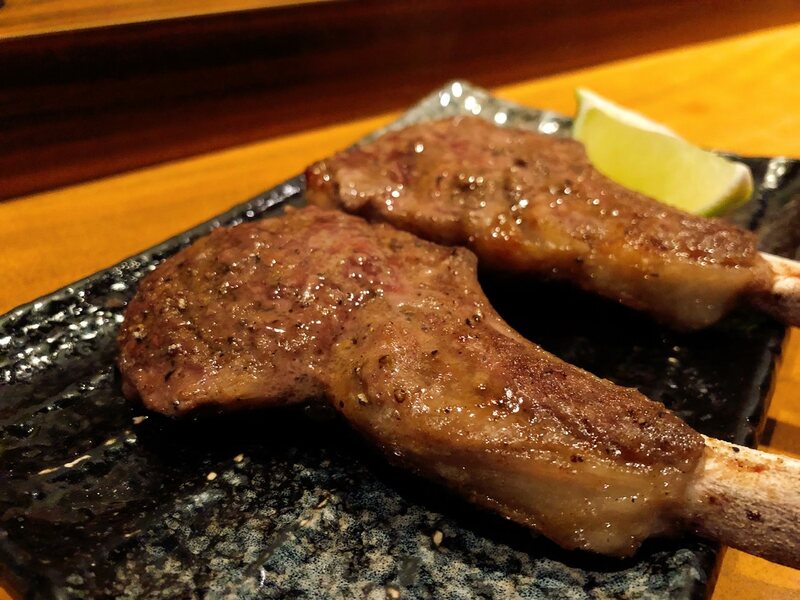 However, the meat texture is not as dense as “Zen Food restaurant”. 薄切松板豬紋路明顯, 但脆度極高也不會乾柴, 只是肉香並沒有明顯, 建議沾一旁的胡麻醬展現日本風格, 適度份量可與4 人分享. 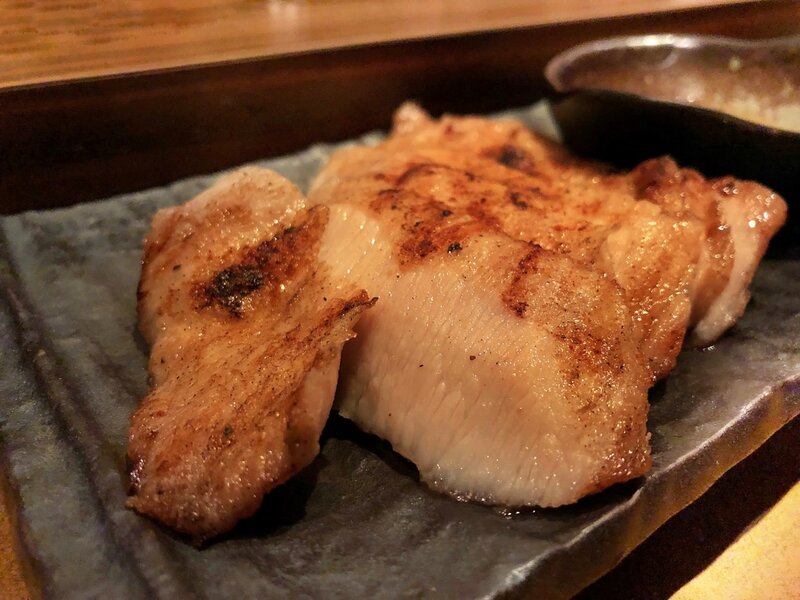 The thin sliced pork neck is crispy but not dry. However, there isn’t much flavor. I would suggest to dip into the sesame dip sauce to have more flavors. The quantity is suitable for 4 people to share. 其實我有遇過燒烤店烤透抽端上桌是花枝圈擺盤, 我個人比較愛川賀居酒屋一整隻透抽的擺盤方式, 店家很明顯的告知客戶他們是用整隻透抽. 店員解釋透抽是捕獲後急速冷凍, 燒烤後肉質依舊 Q 彈, 並不會難咬, 我會建議沾一旁的綿密蛋黃醬, 增加少許不同的風味. 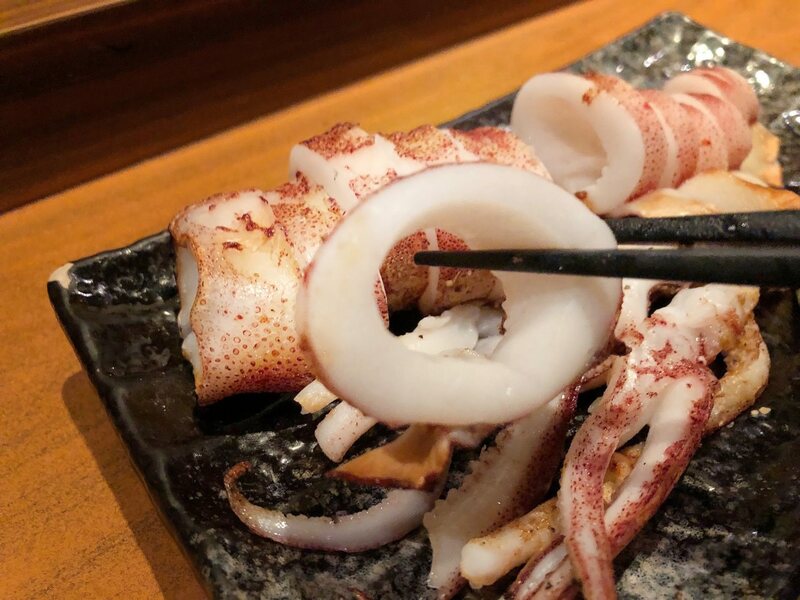 There are a few Izakayas in Taipei that served grilled squid like calamari (messy display). 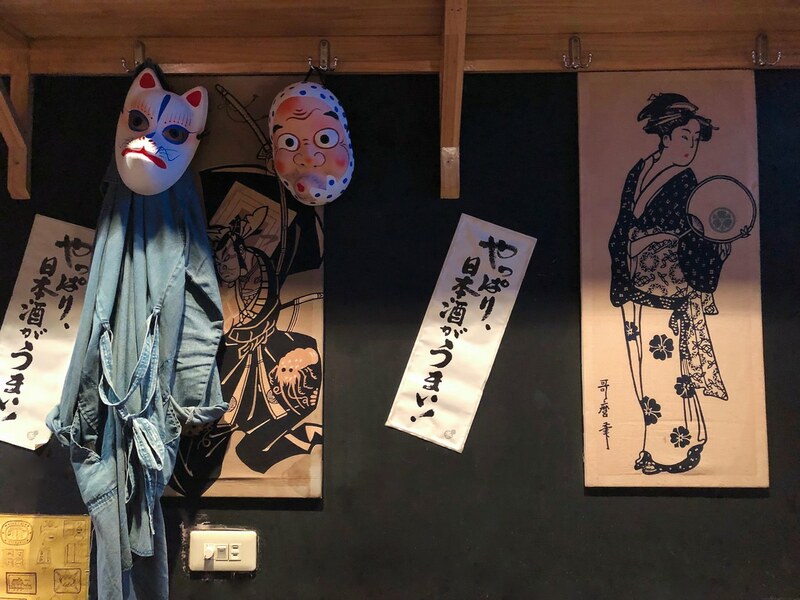 I personally like Kawaga Izakaya’s display. 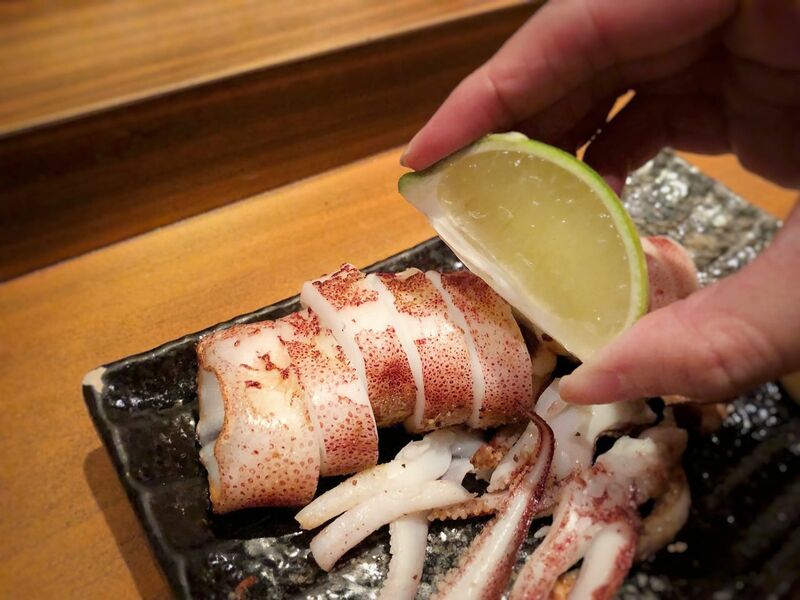 It shows the restaurant is using a whole squid . 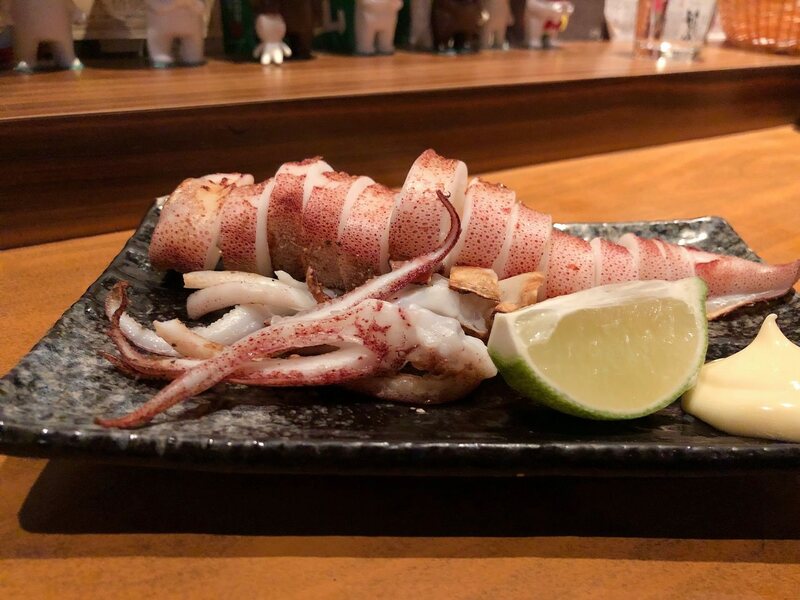 The staff mentioned that the squid is frozen immediately. Therefore, the meat texture is chewy but delicious. I would suggest to dip into the mayo sauce. 剛走進餐廳內就看到放置海鮮的展示冰箱, 除了海膽和干貝外, 也有整條完整的魚. 川賀居酒屋的海鮮幾乎都是時價, 理所當然是以重量來計算, 小黑板上有午仔魚和馬頭魚, 這次店家為我們準備烤午仔魚. 我曾在其他日式居酒屋吃過午仔魚一夜干, 但我比較喜歡 川賀居酒屋的燒烤方式, 撒上一些鹽, 夾起一小塊以著燒烤痕跡的魚肉, 焦香襯托出魚肉的嫩, 鹹香風味不在話下, 酥脆魚皮和緊實魚肉皆帶有濃郁海鮮風味, 若有點啤酒, 這道會是不錯的下酒菜. The seafood price is based on the weight. 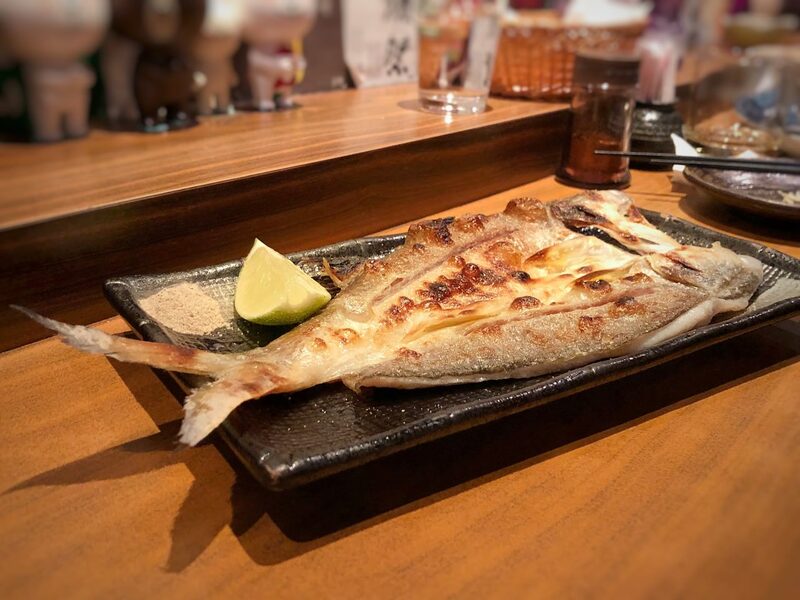 This time, the chef prepares the grilled threadfin. I once ate dried threafish at a Japanese restaurant. 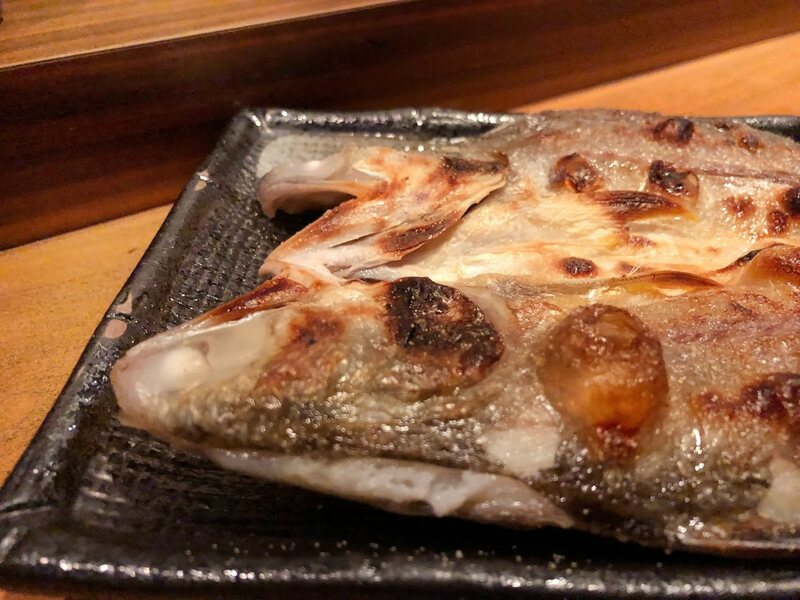 However, I much more prefer Kawaga Izakaya simply grilling method. With simply salts and papers to enhance the seafood flavor from the fish. 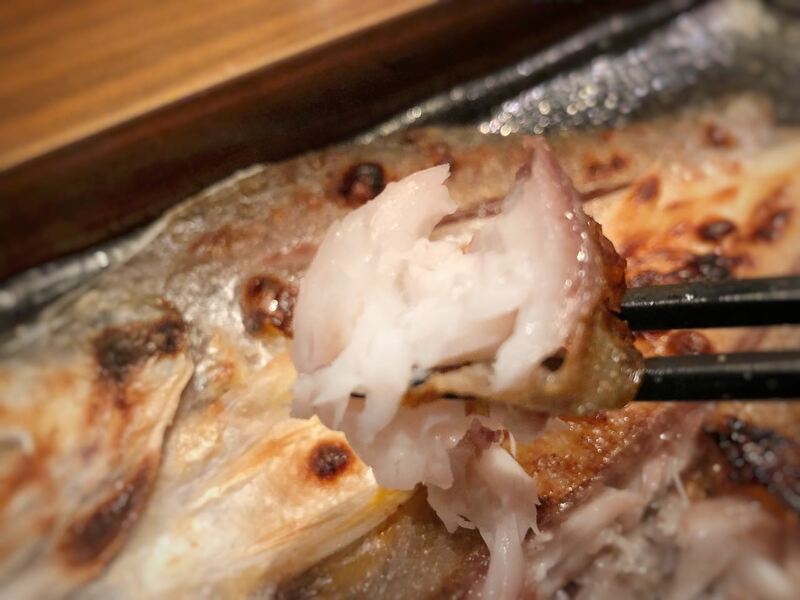 The crispy fish skin is perfect along with the dense fish meat. 酒蒸蛤蜊應該可以算是國民料理, 幾乎每家日式居酒屋都有販售, 也有少數人到居酒屋一定必點蛤蜊,在西式餐廳更是幾乎常見義大利麵搭配蛤蜊 (例如: C Bistro). 此道料理視覺上蛤蜊肉微鼓, 可想而知吸汁完整, 果真一吃就如預期多汁也具有鮮味, 酒香並沒有過於濃郁, 缺點是份量不多, 我跟朋友吃得不夠過癮. Almost every Japanese style Bistro in Taipei has steamed clams. 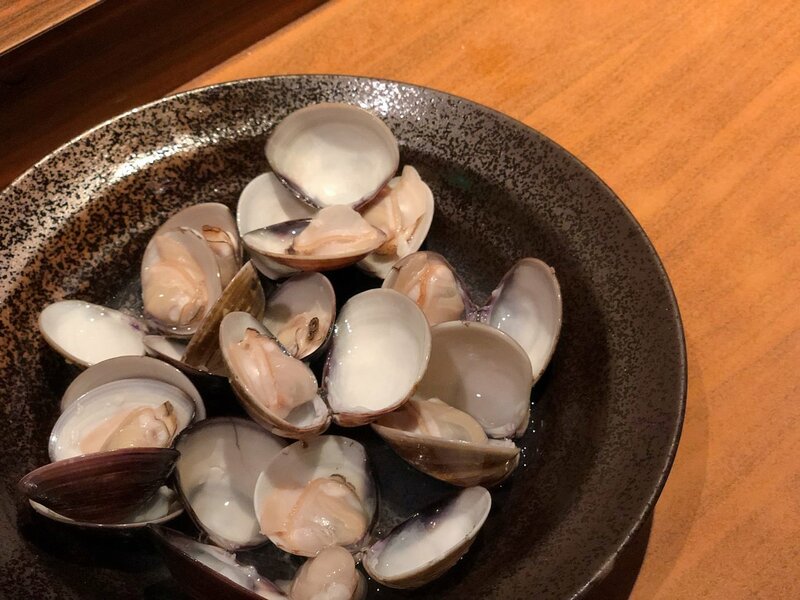 Clam ingredient is used in both Asian cuisine and Western Cuisine restaurants (such as “C Bistro”). 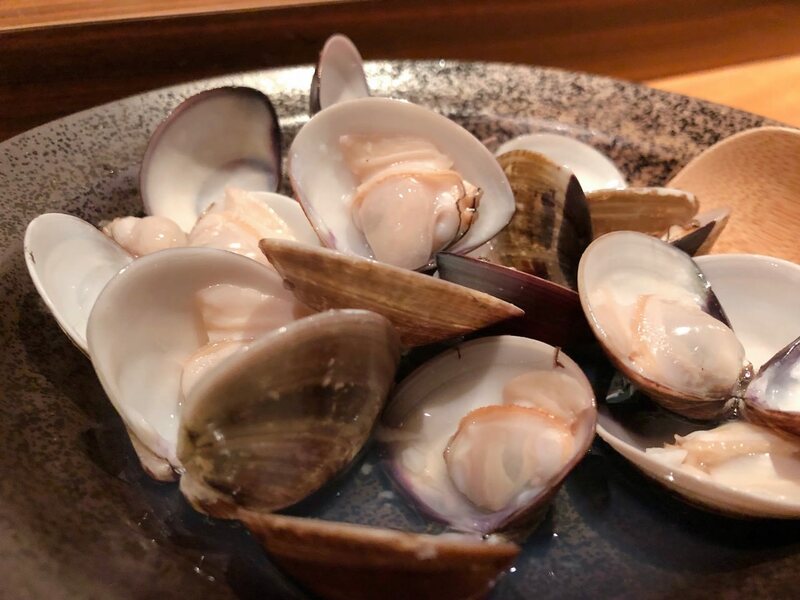 The clam meat is juicy. But, the quantity is not as much as expected. 有些人每天都要吃綠色蔬菜, 要不然整身會不舒服, 但是到日式燒烤屋其實並沒有太多選擇, 川賀居酒屋菜單有炒水蓮和空心菜. 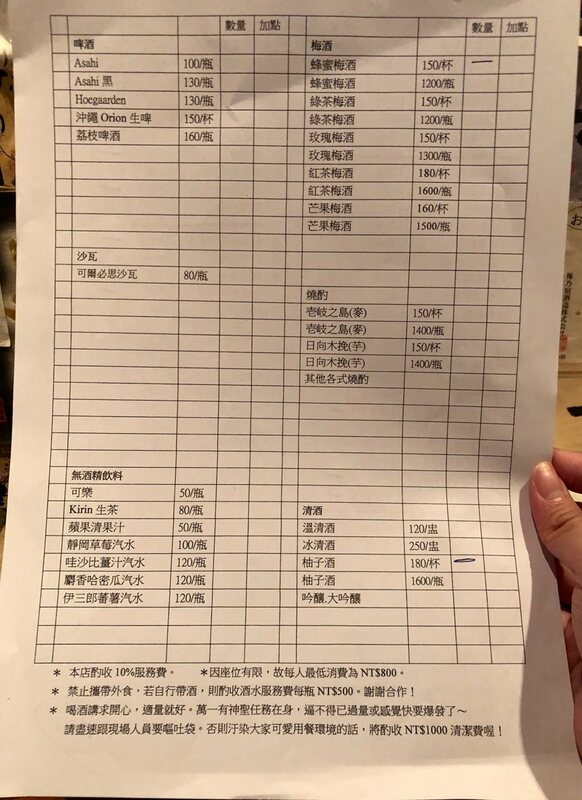 此道料理的炒水蓮除了蒜頭外, 也看到店家自製蝦醬, 蒜味重搭配濃郁蝦醬的海鮮味外, 鮮綠色水蓮每一口皆是清脆, 我會建議四人以上點這道菜. A few people would need to eat green vegetables everyday. However, there isn’t much options at the Grilled House. 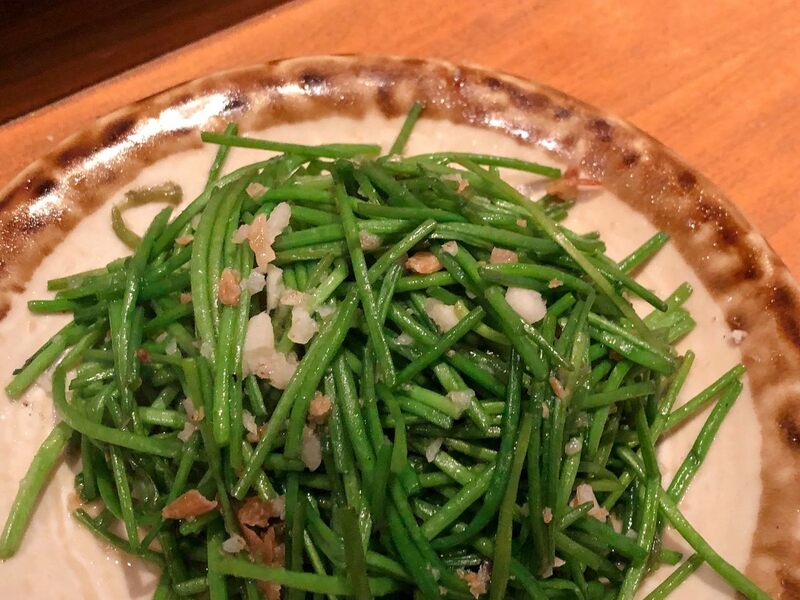 But, Kawaga Izakaya has Stir-fried Water Snowflake (It is rare at Western Cuisine) and Water Spinach. Besides the garlic, this dish also have custom-made shrimp paste. The garlic flavor and shrimp flavor both dominate this whole dish. The green water snowflakes is crispy and fresh. 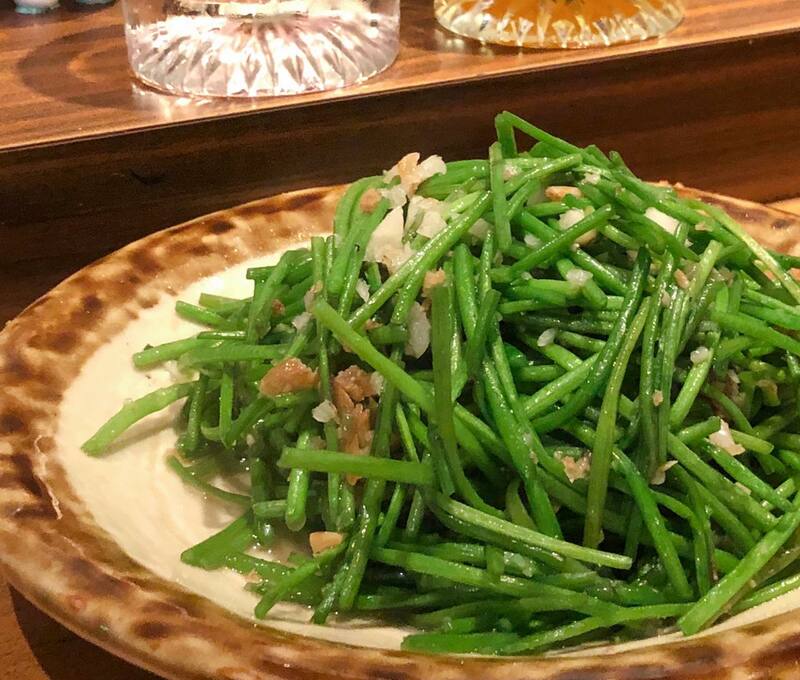 I would suggest four people to share this dish. 圖左是蜂蜜梅酒, 圖右是柚子酒. 台灣有些日本料理餐廳都有自釀梅酒 (例如:”長田和食” ), 我朋友多才多藝也曾經自釀過梅酒, 我喝川賀居酒屋蜂蜜梅酒時, 梅子風味遠遠超過蜂蜜氣息, 我朋友此款酒精濃度不高, 我是認為梅酒基本上只是拿來搭配日式燒烤, 並不用講究酒精濃度. 柚子酒是我點的,濃郁柚子香氣並不會輸給與之前我喝過的”沖繩請福柚子金桔利口酒”. 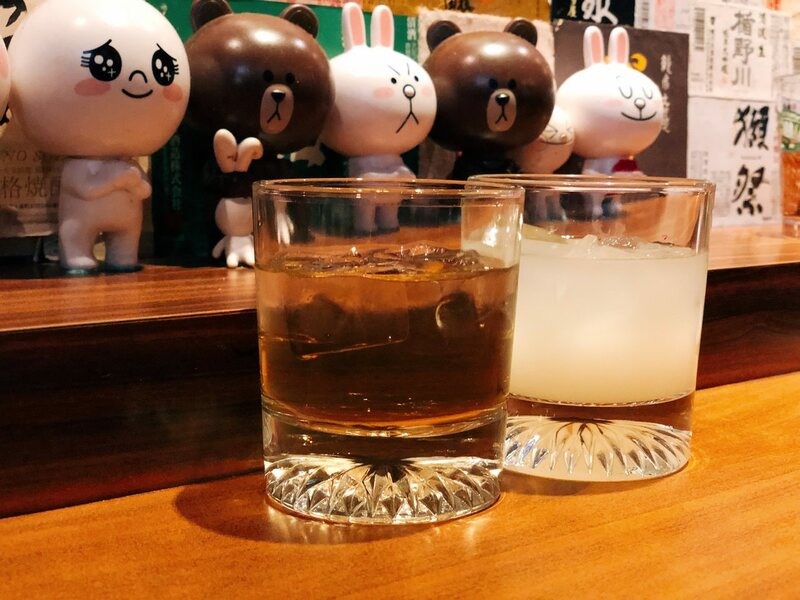 The glass on the left is Honey Umeshu. The original Yuzushu is at the right hand side. There are a few Japanese restaurant that make prume wines (umeshu) themselves, such as “Osada Japanese Restaurant”. My friend once brewed her own umeshu before. The umeshu doesn’t have much honey flavor. The ABV is not high neither. I ordered the Yuzushu, which tastes similar with the “Yuzushu from Okinawa”. I would recommend Yuzushu though. 微粉紅的玫瑰梅酒 (左) 要喝才會察覺到玫瑰花香, 芒果梅酒則是還沒入口就已聞到, 兩種風味蓋過梅子酒經典風味. 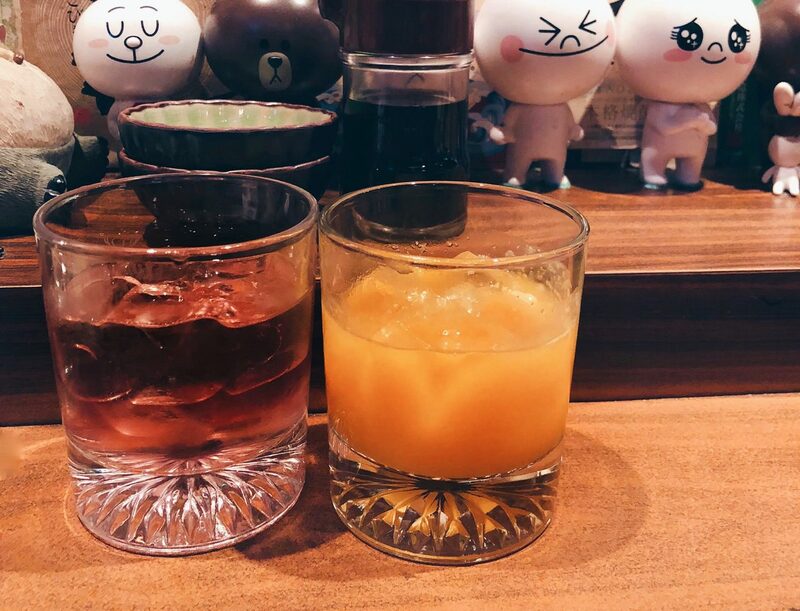 The pink color rose umeshu (left) has hints of rose aroma. The mango umeshu has strong mango aroma. Both flavors cover the classic umeshu flavor.